On Friday afternoon I hurried out of work and jumped on the train, impatient to arrive home. I dashed off the train and to the house, straight up the stairs and into the kitchen, pausing only to kiss Danni hello. I had important cooking to do! But before all this: I woke up and marinated some tempeh in a mixture of tamari, garlic and sesame oil. And before this: I cooked dinner Thursday night, and as the beans simmered, I prepared a nacho cheesy dip. We were going to a potluck! Kristy is new to the world of gluten-free living. 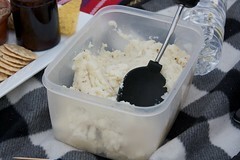 Prior to this, she had been planning a cheese-themed picnic potluck for Friday afternoon, so she modified it to a gluten-free and maybe cheesy (vegan OF COURSE) picnic potluck. So keep in mind as you look at these delicious foods that everything that follows is vegan, gluten-free, and VERY TASTY. So, you may be thinking, in what did all Steph's rushing about result? Well, I am glad you asked! 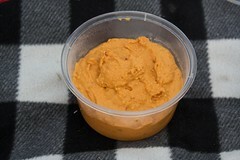 It resulted in an amazing nacho cheese dip, about which I will blog (in detail) shortly. It tasted just like nacho cheese doritos, it was excellent! I do wish that we'd perhaps allowed it to soften a bit before we'd served it, as it was a bit on the solid side. 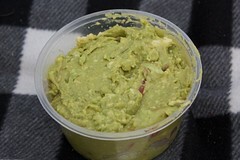 And, since we were a bit time poor, Danni made a guacamole to accompany it. 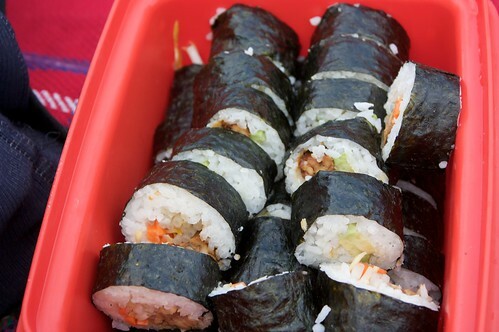 We rounded out with a quickly thrown-together set of sushi - it's the perfect picnic food, though admittedly not very cheesy! 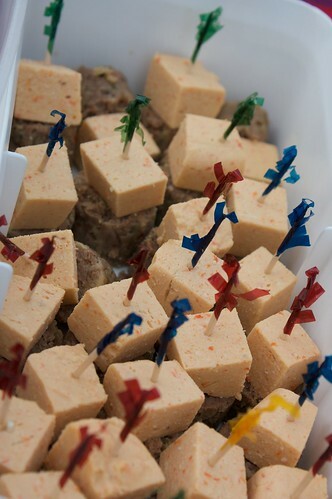 Cindy and Michael astounded us with these cheese and sausage stick things - they were pretty nifty! I really enjoyed both their taste and the novelty factor (cheese and sausage on a stick! Reminds me of primary school). I know (because she told me) that Jo really wanted to stick with the cheese theme, so went with 'things you might find on a cheese platter.' I think she should be commended for commitment to accuracy, because the mushroom pate she made included a thin film of oil across the top, similar to one you might find on actual pate. (gross but) Awesome! :o) The recipe she used was this one here. 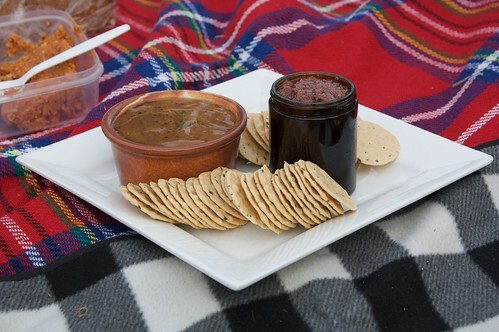 Her submission also included an olive tapenade, no opinion on its awesomeness because I can't stand olives. Vicki managed to track down the mysterious and elusive (and expensive) vegan and gluten-free pastry, rumoured to exist somewhere in the supermarkets of Melbourne. With this critical item in hand, she rocked in with spinach and 'cheese' sausage rolls! 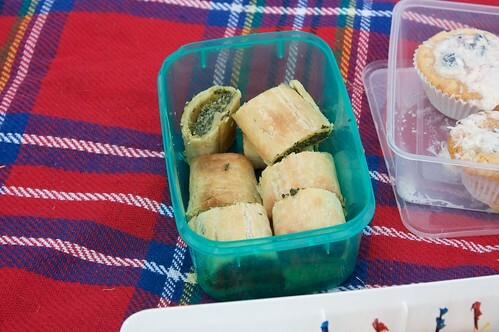 The pastry was a bit crumbly (to be expected, as Vicki reported it was falling apart as she tried to roll it), but the filling was delicious and it was an excellent and tasty addition to our picnic! She has blogged the recipe here. In VERY delicious news, Bec and Craig turned up with some amazing potato products. Craig made some potato cakes, which I am going to attempt to replicate ASAP, and because Craig refuses to blog, I am also going to replicate the recipe here shortly, so that everyone else can try them. They were deep-fried battered fatty potato goodness, they were so tasty. I want to make these for Amanda immediately! Then Bec produced this mashed potato. "So what?" you might say. "Anyone can do mashed potato." Well, anyone can do mash potato, but this mash potato included some Tofutti sour cream, and I have never done that before but I am totally going to do it from now onwards. It added something awesome to the potatoes (I love potatoes). Kristy and Toby made some cheese-related items. Toby made a goat's cheese sort of thing, that a lot of people declared was more like a loaf, and Kristy made this cheesy dip - I didn't try either of these, they were on the wrong side of the blanket and I was too full! 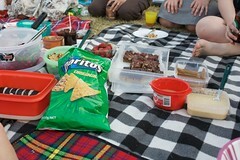 Hooray picnics! I didn't manage to sample everything savoury, nor did I get close-ups of everything. Some of the stuff I missed: a beetroot salad; crumbed tofu (actually I tried this, it was like fish fingers); strawberries; more chocolate things; olives; more chocolate things; a rice salad; crackers; and apparently my feet. And apparently also whatever Johanna made, but I'm sure I ate it. Hmm. I am really enjoying this obsession with ice cream. 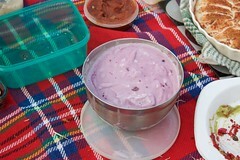 Every picnic, every gathering, it seems we have amazing ice cream with which to contend. This potluck, fantastically, was no different! 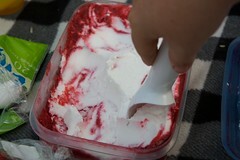 Cindy pulled out a raspberry ripple coconut ice cream, constructed at Craig's request. What an amazing idea! This idea, plus the execution of the potato cakes, may possibly have made Craig the winner of the potluck, but that is open to a vote and he would have to contend with Kristy's blueberry cheesecake ice cream! BLUEBERRY CHEESECAKE ICE CREAM. My word, we may be vegans but we do not sacrifice taste and deliciousness, I hope that is obvious. There were other dessert things, some of which I tried, many of which I did not. I made the tactical error of trying the chocolate goods before any other sweets (aside from the ice cream, of course, which had to be eaten first before it melted, oh the horror). I really have to remember that chocolate, in bulk, does not agree with me, and there was a large number of chocolate sweets with which to contend, including chocolate balls and a number of slices (not all of which are pictured below, mostly because my camera skills - and the fading light - failed me). Other sweets included carrot muffins with cream cheese frosting by Vicki, buttery cupcakes by Carla, and a pear torte by Bec (the latter of which was so rich). Also pumpkin cheesecake brownies. 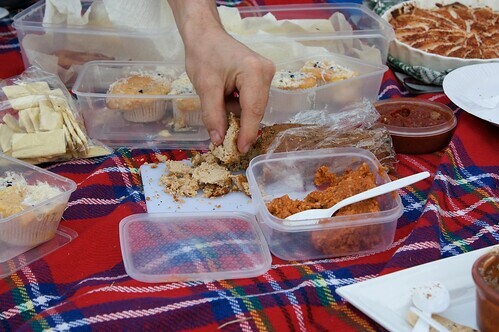 There should be more picnics. Because they're awesome. The first thing we did with my family, of course, was go in hunt of some noodles to share. We wanted to go to Idea Fine Foods for their excellent combination of CNY and noodles but, alas, they have closed! 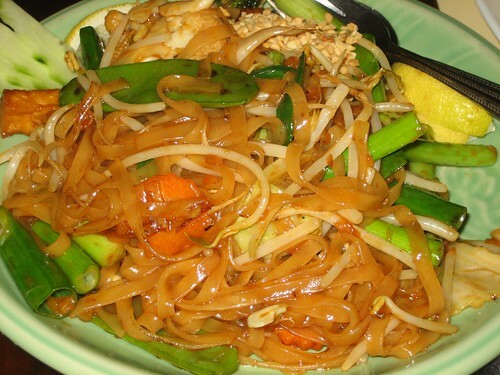 Warm and hungry and slightly grumpy, we turned around and went to the Thai restaurant across the road, Sawasdee. Up the stairs we found the mezzanine busy, but were quickly seated even without a reservation. Our waiter claimed that there was no fish sauce or shrimp paste in the vegetarian curry, so we took him at his word and ordered a green tofu curry and a dish of noodles. The curry was spicy but quite flavoursome, and it was a good meal. And there was a guy playing a piano! Which made me laugh. On Sunday we jumped on the train and ventured out to Box Hill for yum cha. We were excited! I love going to Vegie Hut for a nice combination of yum cha menu and lunch menu, but upon our arrival we were disappointed to find out that, due to CNY, there was no lunch menu available! Only limited yum cha, and a special Chinese New Year menu. We can eat a CNY menu anywhere, we were there for yum cha! No radish cakes, no taro cakes, which was a bit disappointing, and if you can't order noodles than what is the point? Still, the grilled dumplings were good, as was the sticky rice, and we finally tried the four seasons buns. A word to vegans - the green bun is definitely kaya, which always contains egg (it is next on my list of Malaysian treats to veganise). We ended up at Penang Affair on Brunswick Street for dinner. The uncle there was delighted to meet my mother, with whom he immediately started chatting (in Hokkien) to work out if they knew any of the same people (they did not, although they did remember the same restaurants of the streets of Georgetown some forty years ago). Of course (of course!) we ordered a CKT, because I love the CKTs available at Penang Affair. We also ordered a couple of serves of roti, a sayor campor, and a really great gulai campor. The gulai campor was seriously delicious, and went perfectly with the roti. I also ordered a spectacular cocktail, containing a whole lot of fresh chillies, that was a little too much for me to finish. Monday morning saw us at Grigons and Orr, to which I have been eager to return since our first visit in December. 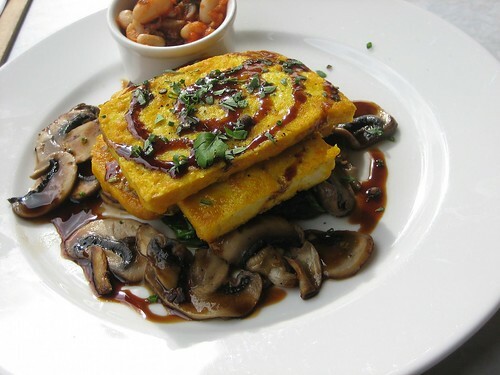 I ordered the pan-fried tofu in soy sauce, with a side of baked beans. It was delicious, but I'll be honest - it was nowhere near as delicious as the cous cous porridge of my previous visit. Orange juice was pretty tasty, and Julie really liked her mushrooms and toast (and her hashbrowns, which are not suitable for vegans). 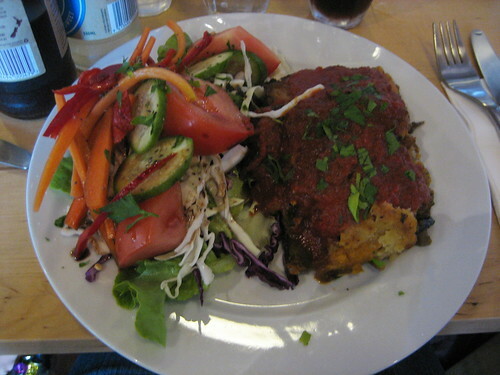 We adventured out to St Kilda, where we had lunch at Lentil As Anything. My mum had watched a documentary (or something?) on Lentil as Anything, and was saddened to hear he was running out of money so was particularly interested in going. There were a lot of things not on the menu on Monday, and we suspect it's because their vegetable delivery had yet to arrive (it turned up as we were leaving). So my parents shared the mixed curry plate, and Julie and I both ordered the okonomiyaki. It was massive! Delicious, but massive, I had to grab a container from the Spud Bar next door and take the remainder home! For Monday dinner we hit up Shakahari, dressing up and ordering cocktails. Danni and I shared the potato gnocci which was served in a tamari sauce with snow peas - it was odd but tasty. My parents shared the soup of the day, it had almonds and broccolini which didn't appeal to me but was apparently very good. For mains I tackled the 'memory of medina,' cous cous with an eggplant curry. My mother, Malaysian to the core, picked the Malaysian curry. Danni and my sister both opted for the pie, filled with mushrooms and accompanied by giant garden salads. All verdicts were good, and my father decided that this was the best vegetarian restaurant I had brought him to all weekend, which is a compliment I suppose. Then on to dessert, for which I was glad I had kept room, for Danni and I shared the mango rice pudding and it was delicious, oh so lovely. My parents had the fruit crumble which was light and tasty, and my sister the mango sorbet. Mangos all around! As it should be. On Tuesday I took them to the airport, and that was the end of our CNY adventures with my parents (not, of course, the end of CNY adventures as there is yet time!)! It was super awesome that they were able to come across to share noodles and traditions with us, and bring us CNY goodies and an adorable tiger, as is custom. There could have been more noodles, though. My parents and my sister came across from Perth for Chinese New Year (it's like Christmas, but longer, you know). I took the day off from FoE in order to go to pick them up from the airport, so with my morning free Danni and I first went to Ceres for brunch with Jo and Em, where we all had the vegan big breakfast (oh yeah). Following this, Danni and Jo decided to bake some cupcakes. 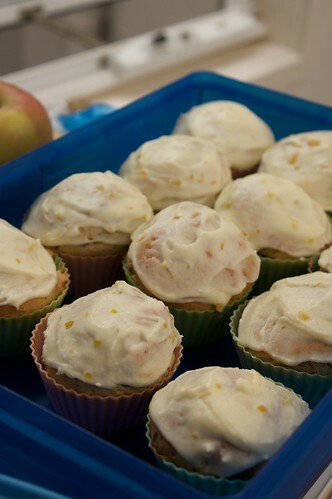 Upon collecting them from the airport, we returned to find these delicious cupcakes waiting! 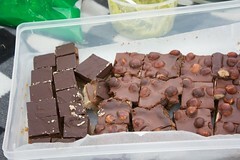 They were chocolate and orange, and were very delicious! Tangy and chocolatey, and the icing was perfect! With thanks to Em for her assistance in grating the chocolate. 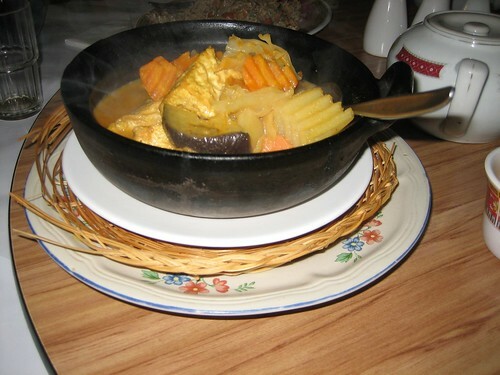 Claypot curry - claypot can be easy to mess up, and I've never had a claypot curry before, but this was delicious. 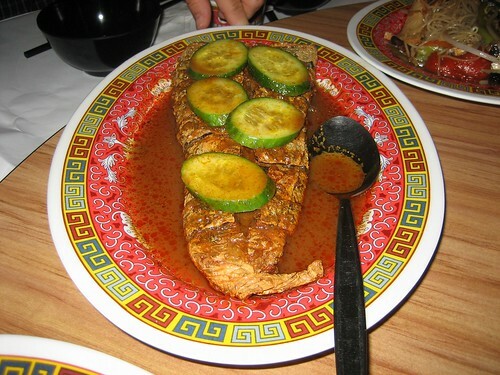 tamarind fishie (鱼) - at J's insistence, and it was really good, just tamarind-y enough. 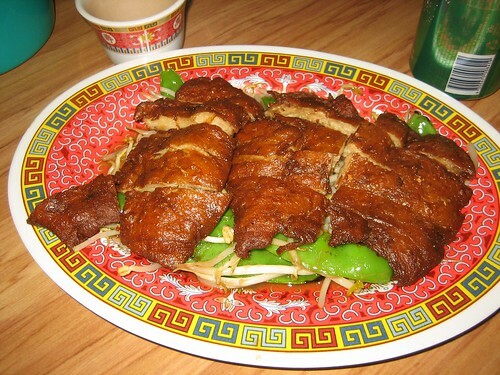 roast duckie (鸭) - very important! There were other things, too. The lemon chicken was pretty good. 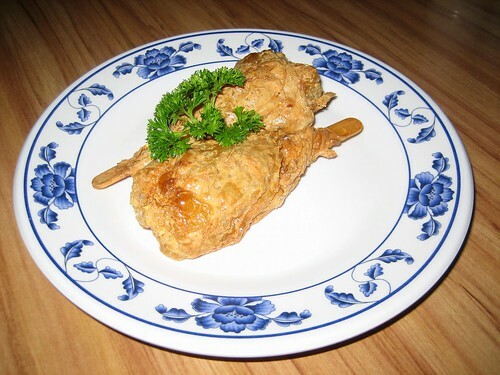 oh yeah beancurd skin drumsticks, you're the best. Overall: it was okay. Would probably go back again. 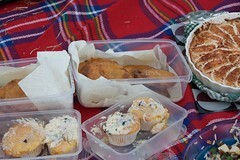 I managed to make it along to the El Joyero Market a few weeks ago, where Pip had a stall. I bought a few things, including some of her delicious roast pumpkin, cashew ricotta, and silverbeet puff pastry triangles. Inspired by deliciousness, a few weeks later we decided to give these a go. 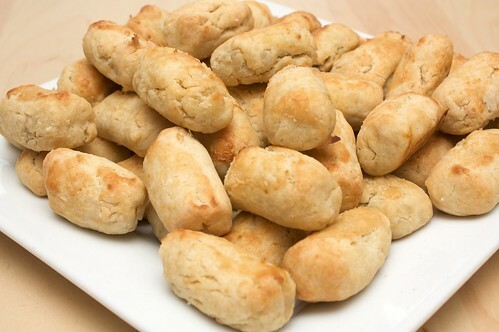 It was mostly guesswork, we found a few recipes for cashew ricotta (in the end, Danni used the recipe in Veganomicon, with varying proportions), then Danni spooned them into some puff pastry squares, folded and baked! 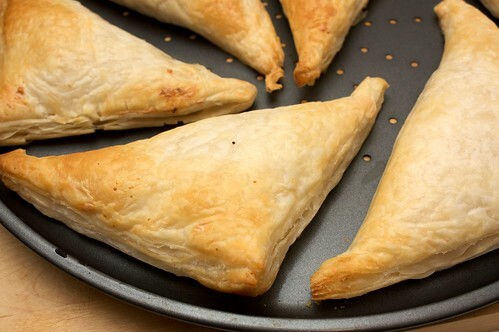 So I came home from class, and there were some delicious puff triangles for consumption. She reports that it was pretty easy, and I report that it was pretty delicious! On Wednesday I spent all day out and about at meetings, then went straight from meetings to class, so I knew that by the time class let out I would be quite hungry. With this in mind, I told Danni that she would be in charge of making sure there was dinner for me to eat upon my arrival home. 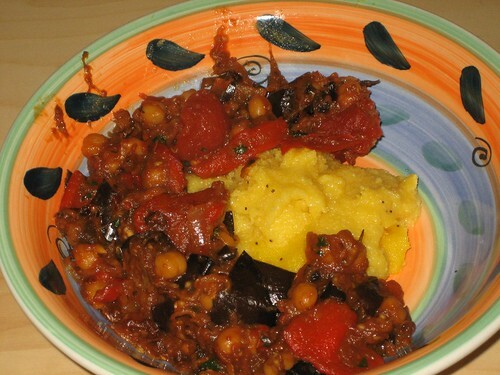 With assistance rendered by Jo, Danni picked the tomato and roasted eggplant stewed with chickpeas, found on page 179 of Veganomicon. 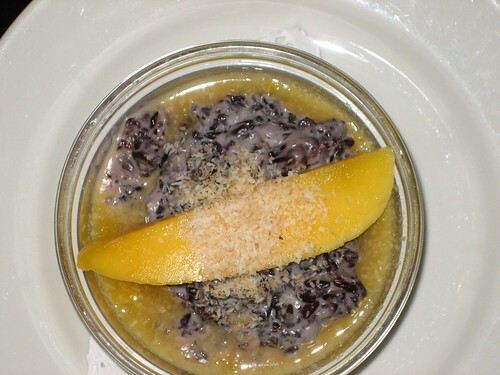 They elected to serve this with the poppyseed polenta, located on page 115. 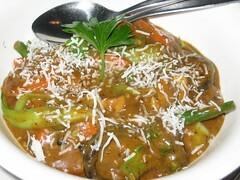 I really enjoyed the flavour of the roasted eggplant, it added something quite excellent to the stew. Jo and Danni would like me to point out that this recipe is quite fool-proof. The recipe called for a cup of wine, which they added, and then proceeded to drink the rest of the bottle between them, so by the time I got home they were both extremely soused, and they had followed the recipe all out of order. And yet it was still quite delicious, and very enjoyable. Even allowing for inebriation, Danni suggests the 'one hour and ten minutes' given for the recipe is a lie, though the forty minutes roasting is correct. On Friday I did a shift in the FOE tent at the Sustainable Living Festival. And then, about 1400, I went for a wander to find some food. 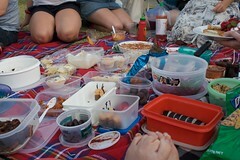 All the food tents at the Festival are vegetarian, and there was a lot of vegan food (including vegan okonomiaki). 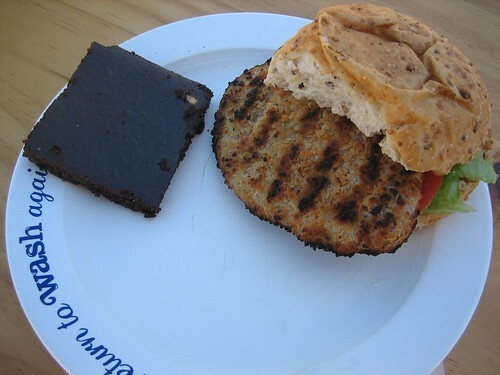 I went for the super delicious food at the ALV stall, a schnitzel burger and one of the brownies from Nelly's Vegan Bakery. Adventurous, right? 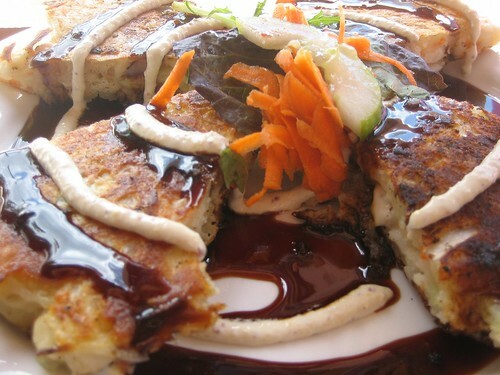 I also wanted to try Umalicious Cafe, which had some tasty looking vegan noms. The SLF is still on today, in Fed Square and down along the river. I met a tram conductor! I haven't had mun yee mee in ages, but scrolling around my greader a few weeks ago I read this post and thought it was about time I tried cooking mun yee mee at home. 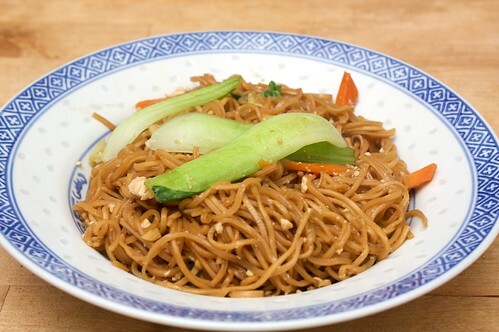 Yee mee is a brown, crispy noodle, usually can be bought as a little nest - this is perfect for a one-person-sized portion. Because they're fried, yee mee have a earthy sort of taste (one which, as it turns out, Danni doesn't like!). Mun yee mee is super easy and a fast dish to cook - you don't even need to presoak the dried noodles, because they do all their soaking in the wok as you cook. On Monday night I got home from two hours of Lindy Hopping, and fifteen minutes later (okay, twenty, because I had a shower first) I had a delicious dinner ready to eat! This is a quick and easy dish. Portions for this are for one person, but it is okay to double for two people. In a little peanut oil (and in a wok), fry the chilli and garlic. Add the carrot and fry for a minute, then add a tiny bit of water and put the lid on. Leave to steam and fry for two or three minutes, then add the stock, mushroom oyster sauce, dark soy and the yee mee. Squish the yee mee gently so that eventually it sinks into the stock. Throw in the bok choy stems, and put the lid back on. After a few minutes, check on the yee mee. It should have mostly soaked up the stock. At this point, crush the tofu and throw it in, and also add the bok choy leaves. Once the leaves have wilted, then it is ready to serve. You see? Quick and easy! 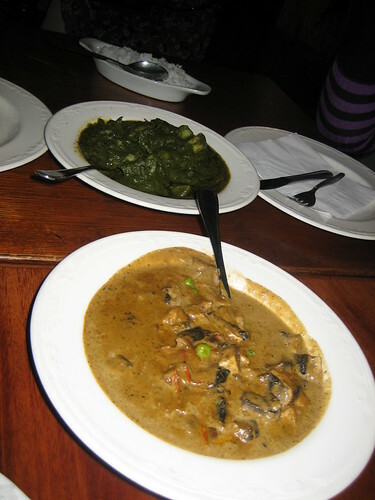 A variation is that sometimes I will cook it in one and a half to two cups of stock, for a soupier version. In the end, these are the pineapple tarts I settled on for CNY. They are gluten-free, suitable for our gluten-free buddies. I think further tweaking is required - I want to try adding custard powder, and I'd love to try something using rice flour. 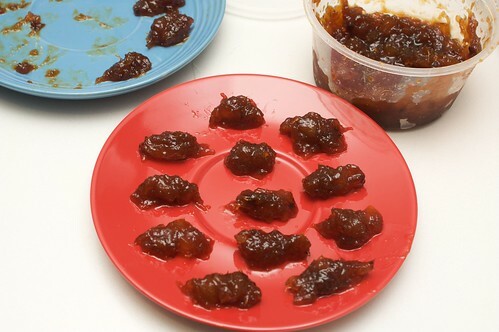 But still, these turned out okay, and I love making and eating these kuih. Some other people's (non-vegan) recipes: A Table for Two; Nyonya Food; The Little Teochew. The GF flour means that these kuih go stale very quickly, so I have to make the pastry for these on the day I plan to serve them. For the jam: Press out as much liquid as possible from the pineapple, and then in a saucepan, simmer with sugar, cloves and star anise for between half an hour and fifty minutes, until the pineapple has reduced. Squish some of the pineapple pieces if necessary. Stir in the gf flour, and remove from heat. Leave this to cool for up to a few days (though it is ready to use after a few hours). For the entartening: Beat together the margarine with the apple sauce. Make sure that you work the margarine from cold, don't melt it or anything. Slowly add the flours, icing sugar, and salt, until just combined. Put in fridge to rest whilst you prepare the jam. 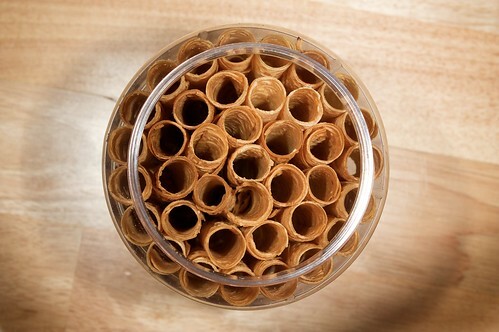 Roll the jam out into little tubes, approx 1.5cm in length. It is easiest if you prepare the jam in this way, so you just pick it up and drop it in the pastry. When I'm working with the pastry, if it's warm I like to keep an icepack under the mixing bowl, to keep it a bit cooler in my warm kitchen. Tear off a small amount of the batter, this will vary depending on how moist it has ended up - it needs to be not too moist, but not too dry or it will fall apart and crack too much. 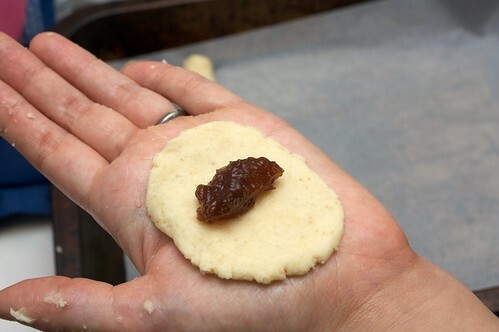 Flatten the batter in the palm of your hand, until it is even and looks like it will wrap around a jam dollop. Drop that jam in, and roll the pastry around it. Make sure there are no gaps, or the jam will leak out when baking. Continue until all the batter or jam is used up. Using a fork, carefully score the surface of the tarts. Combine the remaining apple sauce and milk, and brush on the top. Bake for 18 minutes at 175C in a preheated oven. 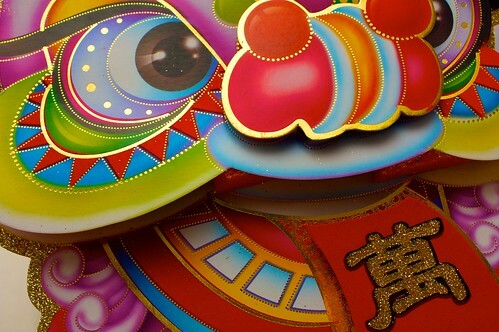 I am feeling the pressure, as many bloggers have already posted about CNY! 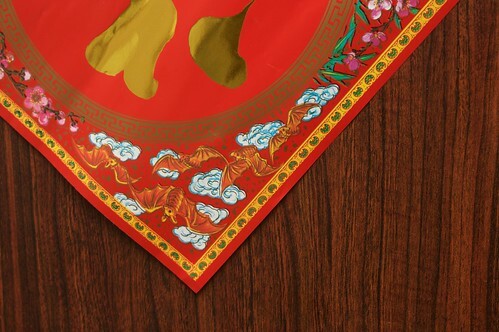 Victor's post also includes some of the background to some of the CNY traditions. This year, as we are far away from my family, instead of the usual family reunion dinner on new year's eve we had a vegan potluck. This was lots of fun, though we have certainly ascertained the upper limit to having people in our apartment (twenty and a baby)! And we had to do the dishes in order to enable dessert! I made a kapitan, probably my best yet due to the fresh lime kaffir leaves I added, and the slight tweaks I made to the paste (a combination of chilli flakes, cinnamon, cumin, coriander, fenugreek, garlic and shallots). I also cooked up a quick choy sum and garlic in tamari sauce, because I figured that nobody would bring a vegetable dish (I was right!). ETA: oh! Tahn reminds me that she brought a veggie dish also. This is what happens when I don't take photos! Because I was so busy finding bowls and making sure there was enough room on the table, I didn't have much of an opportunity to take photos. As a result, I will have to rely on others to post about the delicious food, and I will update this post as they do, so check back! There were some amazing dishes (almost all of them gluten free!). 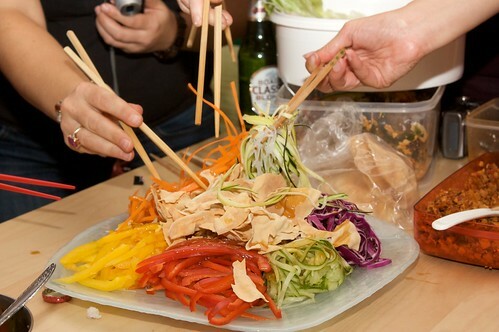 Danni did, however, manage to take photos of Em and Jo's yee sang, about which I want to talk. I was really excited when Jo said they'd be bringing yee sang! Yee sang is a SEA Malaysian/Singaporean CNY tradition to bring abundance. Making the yee sang is quite time consuming, though relatively uncomplicated (although be careful, Em managed to injure herself! 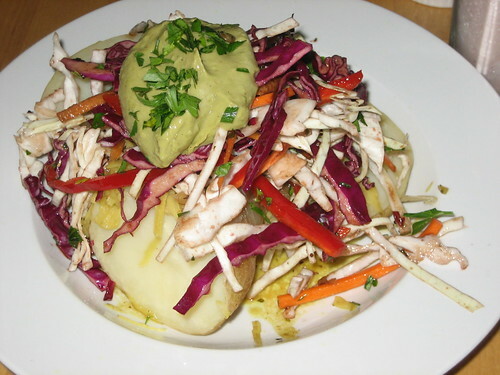 ), as there are lots of long, thin pieces of vegetables. 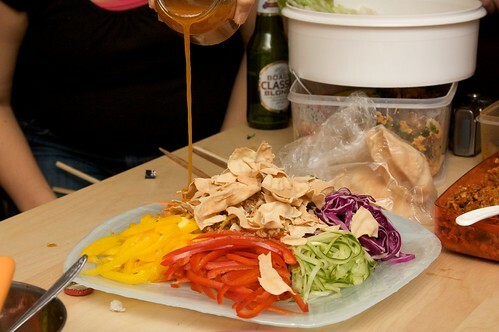 Serving the yee sang is very straight forward, crack the dried stuff (in this instance, gluten-free papadums, but dried tofu skin or yao chao guai is more traditional), pour the sauce, and then toss. The higher you can toss, the more abundance you'll bring, so it can get very messy. Yesterday, first day of CNY, because we hadn't had any noodles at the dinner, after going to the movies I cooked up a char kuay teow and some fried rice with the leftover rice from the night before. Now we're all set for the new year! Sadly this means my hair is dirty, because of the no-washing rule (can't wash hair on the first day, and I didn't have a chance this morning). But other than that! ETA: Vicki has posted about her gluten free sponge cake; Johanna has posted about pearl balls and apricot balls; Michael has posted about dumplings; Cindy blogged about orange and szechuan pepper icecream Toby posts about radish cakes. Since I've moved away from my mum, I've been trying to make a more concerted effort to cook the things she used to cook for me, that I never bothered learning to cook. 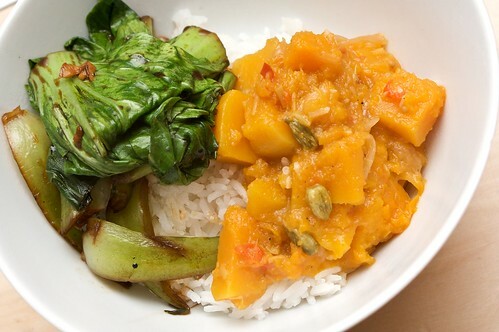 This pumpkin curry only entered her repertoire after we went vegan, but it quickly became a favourite so I was inspired to try cooking it recently. Vietnamese mint or curry leaves. In a small amount of peanut oil, fry this paste until fragrant. Add in the pumpkin, mix through, then add the veggie stock. Bring to a boil, then reduce heat and simmer on medium for about half an hour, until the pumpkin is soft, almost starting to go to mush. Check the curry occasionally, you may need to add a little bit (only a little!) more liquid. This makes a good dish with something else. Serve warm. 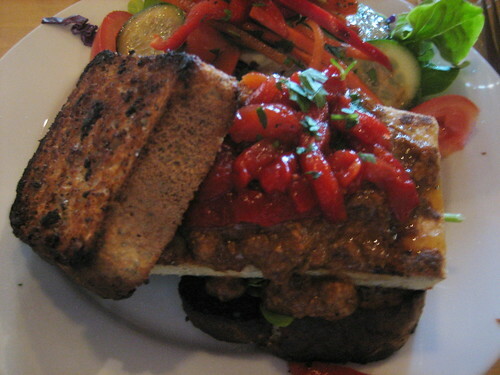 I tried scrambled tofu for the first time just over a year ago, during a visit to Naked Espresso in NSW. That was quite exciting for me, but I didn't eat it too often between then and the end of 2009. I tried the scramble at Tom Phat, and tried cooking it once or twice. What really pushed me to cooking it at home, though, was receiving Vegan Brunch for Christmas. 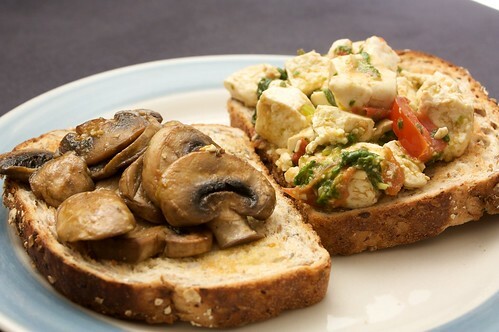 I tried the scrambled tofu with pesto, and that was pretty amazing, and since then I've been combining all sorts of similar things to get delicious tofu scrambles. The pictured scramble features tomato pieces, pesto, and wilted spinach. Other current favourites include caramelised red onion with grated carrot, nutritional yeast flakes and turmeric; and caramelised brown onion with soy sauce. We only went to Plush Pizza two weeks ago, and it's on the other side of the city, but last night we were in the mood for pizza and didn't want Mr Natural, we didn't want to drive to Eat Pizza, so we rang Jo to see if she was doing anything and trekked right on back to Hawthorn. Jo, having tried all but three of the pizzas on the menu, insisted that Danni and I pick different pizzas from our previous visit. I didn't hesitate before ordering the Tom Yum Pizza. It was totally worth it! 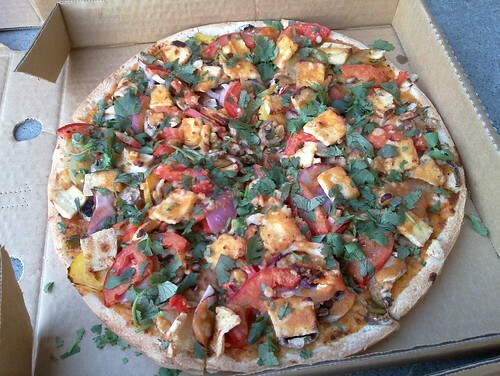 From the menu: Mozzarella, button mushrooms, red onion, capsicum, sliced roma tomato, fried tofu and Thai tom-yum sauce. Garnished with fresh coriander. It wasn't quite like eating tom yum on a pizza but it was very delicious! A++ will order again. And I really enjoyed the fresh coriander on top, which is a big thing for me! Next up, the Verdi, one of the three that Jo had not previously tried. This was okay. Jo and I liked it well enough, but wouldn't be clamouring to order it again. Danni on the other hand, loved it. 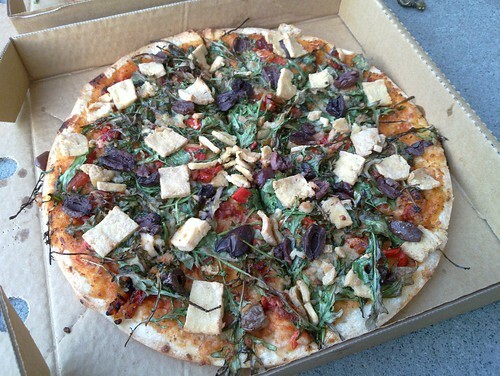 From the menu: Mozzarella, pesto, semi-sundried tomato, roasted capsicum, rocket leaves, olives and fried tofu. The pesto was tasty, but the rocket was shriveled and dried from its time in the oven, and I didn't enjoy its crispiness. 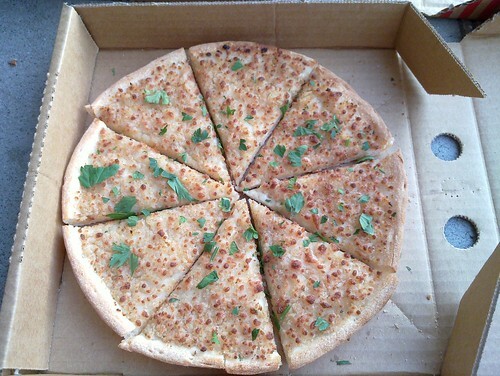 Both times we've been now, I've ordered a small garlic pizza, in lieu of actual garlic bread. It's pretty good! Dry and crisp and garlicy, it's delicious! Terrible news! 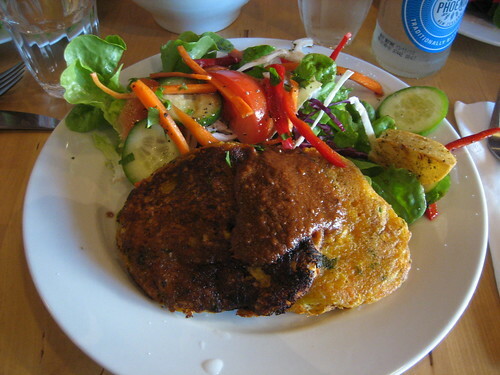 I have been trying to locate vegan kuih kapit/love letters in Melbourne, but to no avail! They all contain egg! Miss T, who conveniently is currently in Perth, attempted to purchase them for me from my mother's Chinese grocer (in Perth), because my sister swore to me that they are selling vegan love letters, but alas! Fail! My parents are coming to visit in just over a week, and obligingly they will bring me some, but I want them for CNYE! Does anybody know where I could find them? I've tried many grocers on Victoria Street in Richmond, Minh Phat, and the vegetarian grocery in Box Hill. I will probably adventure out to Footscray as soon as I get an opportunity. I am willing to travel! Mostly because I am not willing to make them. Here are some other examples: folded (usually not vegan); rolled (sometimes vegan except apparently not for meeeee). Any assistance that anyone could offer would be greatly appreciated. Why is this city not more Malaysian? It pains me. 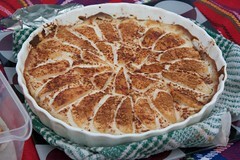 PS ALSO my macbook failed, and took all my unpublished recipes with it! So the pineapple tarts have returned to 'experimental' status. I've heard a lot about the amazing vegan foods available in the approximate Richmond region, however living on the other side of the City, we don't often get over that way. We made a recent visit to Plush Pizza, which was totally worth the trip, and last Friday Jo directed us down to Vegetarian Nirvana for dinner. Jo insisted on ordering the mushroom masala. I wanted the palak aloo, because it is my favourite, and Danni settled on the dahl makhani, because it always, always has cream and ghee in it. We also ordered a whole lot garlic roti. The food was really really tasty. We thought perhaps we'd over-ordered, but we were compelled by deliciousness to eat it all up, and we rolled on out, uncomfortably full. The only downside was that we had arrived late in the evening (after 2000), and the food took about half an hour to arrive, which is usually not a terrible thing except I was so hungry I went from 'hungry' to 'grumpy,' which was unfortunate for Jo and Danni, who hopefully still like me anyway (we suspect the wait was due to cooking one of our curries from scratch). It was totally worth it thought. 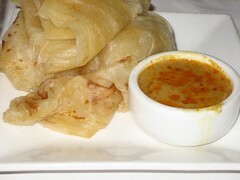 I cannot wait to try their allegedly Malaysian-style roti canai. Hanging with my peeps Amanda and Erin this evening, watching some very terrible television. Amanda is Free of Gluten, and yet has never been to Tart'n'Round. So we thought we should rectify this by making a visit for dinner. I am so delightfully full, oh yeah. Vegan and gluten-free is the best. I ordered the satay tofu burger, with bread instead of a bun. The bread was amazing! Which was unexpected, as I only ever hear people complain about gluten free bread. But it was deliciousssssss. 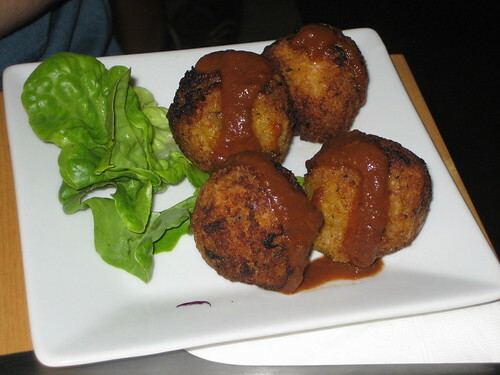 However the highlight of the meal was, for me, these pumpkin risotto balls. 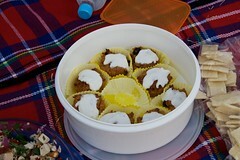 The pumpkin was just a hint, and the risotto balls were crispy and had a lovely flavour. Om nom nom. Danni ordered this baked potato. She declared it was very delicious, but she was unable to finish it, due to the portion size. A loves fritters, so she was super excited to order these sweet potato and corn fritters, which she declared om nom nom. We were super full, so we didn't eat dessert there, but we picked up two lemon meringue pies, two caramel slices, and some cookies and a cherry and chocolate bar thing, to take home to eat whilst we kept watching. E declared the caramel slice not caramel-y enough, but Danni and A loved the tarts. ETA Tart'n'Round is sadly closed! As of March 1st 2010.